Houghton Mifflin Harcourt, 9780544104655, 768pp. New York has been America's city of immigrants for nearly four centuries. Growing from Peter Minuit's tiny settlement of 1626 to one with more than three million immigrants today, the city has always been a magnet for transplants from all over the globe. It is only fitting that the United States, a "nation of immigrants," is home to the only world city built primarily by immigration. More immigrants have entered the United States through New York than through all other entry points combined, making New York's immigrant saga a quintessentially American story. 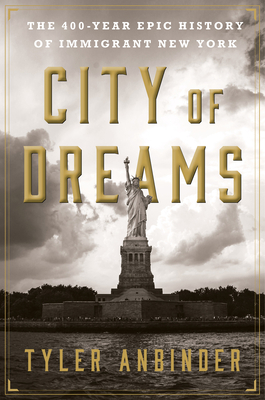 City of Dreams is the long-overdue, inspiring, and defining account of New York's both famous and forgotten immigrants: the young man from the Caribbean who relocated to New York and became a Founding Father; an Italian immigrant who toiled for years at railroad track maintenance before achieving his dream of becoming a nationally renowned poet; Russian-born Emma Goldman, who condoned the murder of American industrialists as a means of aiding downtrodden workers; Dominican immigrant Oscar de la Renta, who dressed first ladies from Jackie Kennedy to Michelle Obama. Over ten years in the making, Tyler Anbinder's story is one of innovators and artists, revolutionaries and rioters, staggering deprivation and soaring triumphs. Today's immigrants are really no different from those who have come to America in centuries past—and their story has never before been told with such breadth of scope, lavish research, and resounding spirit. "Mr. Anbinder has provided a valuable service by crafting a single volume that focuses solely on New York as a gateway, a haven and a crucible that forged the fates of millions of immigrants who in turn shaped the destiny of our nation." "This thoroughgoing work offers a host of immigrant sagas that were integral to the creation of the New York City cauldron...[Anbinder] impressively conveys the sense of a city truly forged by the people who were determined to live and work there... An endlessly fascinating kaleidoscope of American history. A fantastic historical resource." "Full of fascinating, rock-solid history and provides compelling texture behind the larger trends... balanced and excellent."